Boil water in a medium sauce pan and drop in the soaked vermicelli for a few minutes. Drain and rinse with cold water. Set aside. 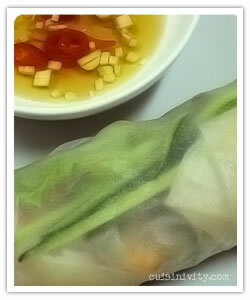 Soak 1 rice paper in a bowl of water for 30-40 seconds until it's softend. Then take it out on the clean damped tea towel (working with 1 rice paper at a time). Place a small amount of vermicelli then small amount of cucumber, carrot, avocado, two prawns and coriander leaves in the middle of rice paper. Fold bottom 1/3 of the paper then sides. Roll up.